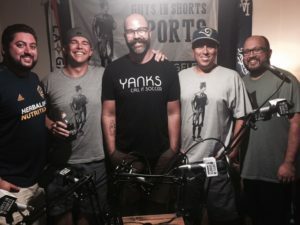 This week we talk about a big game with a lot of hype, inflated ticket prices and doesn’t mean anything… No, not the MLB All Star game, we’re talking about the “infamous” Manchester United taking on the LA Galaxy! In light of this momentous match (that again, means nothing), we’ve recruited the help of Jacob Brown from the “Yanks Call It Soccer” podcast to discuss all things soccer and why we should all be paying attention! Jacob and the guys breakdown US and MLS soccer, plus the correct way to choose your English Premiere League team. Also up for discussion, the MLB All Star Break, Lonzo Watch 2017 and answering if it’s ok to wear another team’s merch when visiting their stadium. All that plus, there may or may not be Christopher Walken impressions!